This was a temporary site. Click Jessica James to go to my main website. Hello and welcome to the site of historical fiction author Jessica James. I'm glad you stopped by and hope you will come back again soon. For those of you who have just stumbled upon my site, I am the author of Shades of Gray: A Novel of the Civil War in Virginia (Jan. 2008), and I am working on my second novel Above and Beyond. 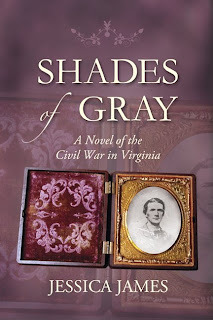 The release of Shades of Gray in January, 2008, was the culmination of years of research on the brave men who fought in the Civil War on the soil of Virginia. As you can see from some of the reviews on the right-hand column, the book has been praised for its attention to historical detail--but don't get the idea it's just a Civil War book. It is, more than anything, a love story. For those of you who have read the book and enjoyed it, I hope you stop back in as I post "the missing chapters." The book was originally more than 1,000 pages, so there are a number of sub-plots that didn't make the cut.